Here’s the full text of the US President’s speech as he ceremonially began his second four-year term. 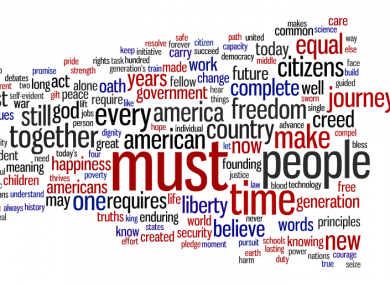 A word cloud of Obama's speech. THE FOLLOWING is the full text of Barack Obama’s inaugural address, as delivered in Washington today, as he ceremonially took the oath of office to begin his second four-year term as President of the United States. The inaugural address usually serves as an indication of the agenda to be pursued by a president in their forthcoming tenure. Obama told his audience – of an estimated 700,000 – that a decade of economic trouble was coming to an end, and signalled his intention to seek full equality for gay couples. Email “In full: Barack Obama's second Inauguration speech ”. Feedback on “In full: Barack Obama's second Inauguration speech ”.